← Needed: Core motor close to running. Preservative and cage free lunch in rural Florida. When you speak in terms like “Cage free”, “Non Genetically modified” and “all natural” people from more densely populated places just assume you are speaking of a trip to the Whole Food Store or one of those places where ‘enlightened and aware’ people shop. Well, here in Florida, we have just such a place in our little rural town, except it is also our local NAPA auto parts store. On Fridays in good weather, lunch is served to the staff and regulars. Today it was particularly fresh pork, which was smoked out back since 7am. Not only was it delicious, but it also met all the credentials touted by the enlightened such as no preservatives, cage free, etc. It is a nice part of living in a place where people are well aware that food does not originate at Supermarkets, and there is a sure fire way of assuring that your food is all natural. I don’t think you can taste antibiotics in supermarket ham, but by comparison it insanely salty, and the ‘glazed’ stuff is only processed sugar coated. I am not a ‘foodie’ but when you are exposed to real natural food, it is a real moment of awareness on how far from normal consumer taste has been dragged. 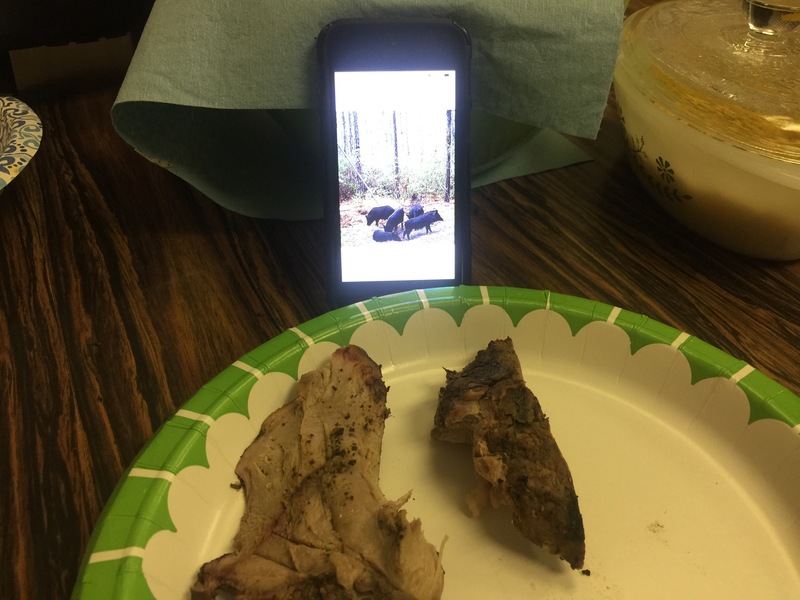 Above: I took the photo of the smoked pork on my plate. Just above it is The NAPA store owner’s phone, with a picture of what my lunch was doing a few days before. Feral hogs are an invasive species in Florida, and they not only do extensive crop damage, they also harm native animals. The fact feral hogs are tasty combined with the high percentage of firearm ownership in Florida works to restore the natural balance in the environment and provide lunch at NAPA. Other than the last 1 second, this animal had a far more humane life than any animal existing in a ‘food’ factory. Lest anyone claim an AR has no sporting use, this meal was provided by an AR-15 chambered in 6.8 SPC. 6 Responses to Preservative and cage free lunch in rural Florida. I had to look up 6.8 SPC cartridge, that was a new one on me and it looks like it is an excellent cartridge for thinning the herd of the feral hog population. There is just no substitute for a meal that slept under the stars the previous night and you make me envious. P.E.T.A : People Eating Tasty Animals. We regularly travel to far north rural Kansas. Always bring back a cooler-load of fresh meat from “the locker plant.” No similarity to supermarket stuff.We know where the meat came from and are usually (depending on the cow / pig) good friends with the rancher.It’s all done the same way it was done in the 50’s (or probably earlier!). Like my fellow Michigan native “uncle” Ted Nugent is fond of saying to the anti-hunting people, “you gotta kill it before you grill it”. That looks like a tasty meal. Oh, gross! hahaha! Not. Moose is the best, lion is doable, bear is greasy, but the elk and deer I personally shot were the bestter…oh, and salmon caught off the coast in a non commercial and filleted myself on the bathroom counter of the motel? Yum!